The Hidden IR Repeater System allows you to use an existing infrared (IR) remote control to operate up to 6 audio/video (A/V) components. 1.Tape the emitters on the devices like Cable Boxes, Xbox One, Roku, Apple TV, Nvidia Shield and so on,Please tape on the nearby of infrared receiving point. 2.Fix the receiver on the most convennient place by remote control. 3.Plug the emitters & receiver in the infrared remote repeater,connect to power supplies,then you could use it. Plasma TV's emit IR frequencies that can interfere with the IR receiver of this device (Not applicable to LCD or LED). This can usually be fixed by placing the IR receiver further away from the plasma TV OR by placing a piece of scotch tape over the IR receiver to reduce. Our biggest concern isn't with earnings or profits,It's with customers' experiences purchasing and using our products. We want satisfied customers and to develop trust in the Tunteil brand. Freely contact us if you have any issues. ★★With 1 IR distribution block,1 receiver which picks up the signal from the remote controller, the receiver is with a convenient IR confirmation LED . Small and easy to hide,high sensitivity,broadband remote control. DVD Player,CD Player,Blu-ray player,Stereo receiver ,Satellite TV receiver and so on.PLEASE NOTE, DOES NOT WORK WITH: Cisco RNG150 RNG150N & RNG250 & Marantz devices. 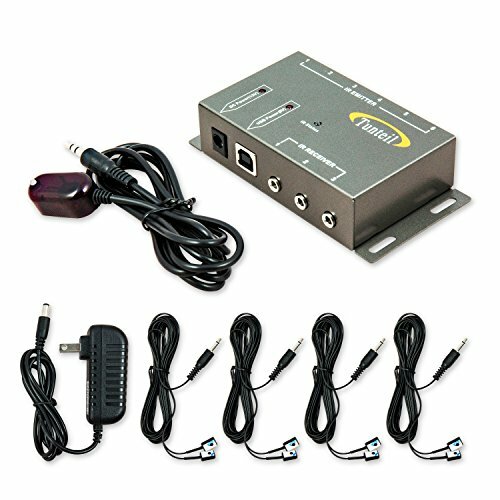 ★★12V DC Power Supply(INPUT 100-240VAC,50/60Hz),34-60kHz operating range,3.5mm mini plug. Easy to use,Control all same devices by one click ,it needn't turn the contriller to all directions. ★★Lifetime warranty on parts and labor. we provide 7x24 hours service,please feel free let me know if you have any question. If you have any questions about this product by Tunteil, contact us by completing and submitting the form below. If you are looking for a specif part number, please include it with your message.